On the AI controller it is sometimes difficult to see the characters if the contrast drifts slightly with time. There are even variations in the contrast from unit to unit as they are manually set in the factory. If this is the case with your controller then you should initially go to option 7 on the control menu and then to backlight. 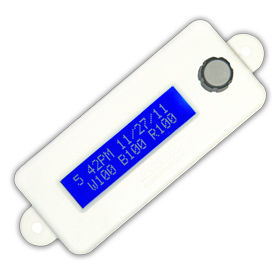 This allows you to raise or dim the backlight on the display from 0-100% brightness. Stage one often increases the brightness but not the contrast and to change this you must go to stage two. 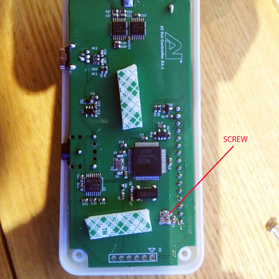 With a phillips screwdriver, unscrew the 4 screws in the bacl of the controller and lift off the lid. Look for the small pot or screw indicated on the image. 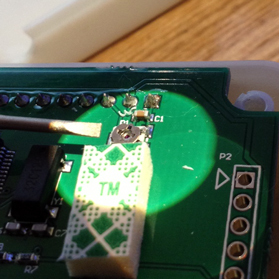 With the controller plugged into the light via the data cable, take a small flat bladed jewelers screwdriver and whilst observing the screen turn the screw fractionally clockwise and anticlockwise until you achieve the desired contrast. You will observe the screen go from 0-100% contrast and back again as you turn the screw. Screw the back on the controller. This is a simple task that can be carried out by most people that can use a screwdriver. If in doubt please consult your retailer.